In 2015, 193 countries committed to achieving the 17 Sustainable Development Goals (SDGs) of the United Nations, a shared vision of humanity that provides the missing piece of the globalisation puzzle. The extent to which that vision becomes a reality will in no small way depend on what is happening in today’s classrooms. Indeed, it is educators who hold the key to ensuring that the SDGs become a real social contract with citizens. Goal 4, which commits to quality education for all, is intentionally not limited to foundation knowledge and skills, such as literacy, mathematics and science, but emphasises learning to live together sustainably. This has inspired the OECD Programme for International Student Assessment (PISA), the global yardstick for success in education, to include global competence in its metrics for quality, equity and effectiveness in education. PISA will assess global competence for the first time ever in 2018. PISA conceives of global competence as a multidimensional, lifelong learning goal. Globally competent individuals can examine local, global and intercultural issues, understand and appreciate different perspectives and world views, interact successfully and respectfully with others, and take responsible action toward sustainability and collective well-being. It is worth looking at these four dimensions in some more detail. Examine issues of local, global and cultural significance. This refers to the ability to combine knowledge about the world with critical reasoning whenever people form their own opinions about a global issue. Globally competent students can draw on and combine the disciplinary knowledge and modes of thinking acquired in school to ask questions, analyse data and arguments, explain phenomena, and develop a position regarding a local, global or cultural issue. They can also access, analyse and critically evaluate messages delivered through the media, and can create new media content. Understand and appreciate the perspectives and world views of others. This highlights a willingness and capacity to consider global problems multiple viewpoints. As individuals acquire knowledge about other cultures’ histories, values, communication styles, beliefs and practices, they begin to recognise that their perspectives and behaviours are shaped by many influences, that they are not always fully aware of these influences, and that others have views of the world that are profoundly different from their own. Engaging with different perspectives and world views requires individuals to examine the origins and implications of others’ and their own assumptions. This, in turn, implies a respect for and interest in the people who acknowledge and appreciate the qualities that distinguish individuals from one another are less likely to tolerate acts of injustice in their daily interactions. On the other hand, people who fail to develop this competence are considerably more likely to internalise stereotypes, prejudices and false heuristics about those who are “different”. Engage in open, appropriate and effective interactions across cultures. Globally competent people can adapt their behaviour and communication to interact with individuals from different cultures. They engage in respectful dialogue, want to understand the other, and try to include marginalised groups. This dimension emphasises individuals' capacity to bridge differences with others by communicating in ways that are open, appropriate and effective. “Open” interactions mean relationships in which all participants demonstrate sensitivity towards, curiosity about, and a willingness to engage with others and their perspectives. “Appropriate” refers to interactions that respect the cultural norms of both parties. In “effective” communication, all participants can make themselves understood and understand the other. Take action for collective well-being and sustainable development. This dimension focuses on young people's role as active and responsible members of society, and refers to individuals’ readiness to respond to a given local, global or intercultural issue or situation. It recognises that young people can have an impact on personal and local situations, but also on digital and global issues. Competent people create opportunities to take informed, reflective action and have their voices heard. Taking action might imply standing up for a schoolmate whose human dignity is in jeopardy, initiating a global media campaign at school, or disseminating a personal opinion about the refugee crisis through social media. Globally competent people are engaged to improve living conditions in their own communities and also to build a more just, peaceful, inclusive and environmentally sustainable world. Naturally, global competence can be developed in many contexts; but schools can play a crucial role in this regard. Schools can provide opportunities for young people to critically examine developments that are significant to both the world at large and to their own lives. They can teach students how to use digital information and social media platforms critically and responsibly. Schools can also encourage intercultural sensitivity and respect by encouraging students to engage in experiences that nurture an appreciation for diverse peoples, languages and cultures. This central role of schools makes a strong case for PISA to examine global competence. All of this leads to the question: How does one assess global competence? In 2018, PISA will make a first start with a two-part assessment consisting of a cognitive test and a background questionnaire. The cognitive assessment elicits students’ capacities to critically examine news articles about global issues; recognise outside influences on perspectives and world views; understand how to communicate with others in intercultural contexts; and identify and compare different courses of action to address global and intercultural issues. In the background questionnaire, students will be asked to report how familiar they are with global issues; how developed their linguistic and communication skills are; to what extent they hold certain attitudes, such as respect for people from different cultural backgrounds; and what opportunities they have at school to develop global competence. Answers to the school and teacher questionnaires will provide a comparative picture of how education systems are integrating international and intercultural perspectives throughout the curriculum and in classroom activities. To what degree are students able to critically examine contemporary issues of local, global and intercultural significance? To what degree are students able to understand and appreciate multiple cultural perspectives (including their own) and manage differences and conflicts? To what degree are students prepared to interact respectfully across cultural differences? To what degree do students care about the world and take action to make a positive difference in other peoples’ lives and safeguard the environment? Are there inequalities in access to education for global competence between and within countries? What approaches to multicultural and intercultural education are most commonly used in school systems around the world? 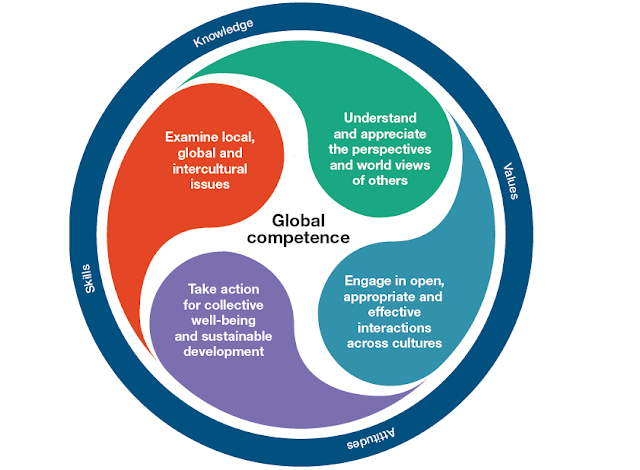 How are teachers being prepared to develop students’ global competence? This assessment offers a tangible opportunity to provide the global community with the data it needs to build more peaceful, equitable and sustainable societies through education. It will provide a comprehensive overview of education systems’ efforts to create learning environments that encourage young people to understand one another and the world beyond their immediate environment, and to take action towards building cohesive and sustainable communities. It will help the many teachers who work every day to combat ignorance, prejudice and hatred, which are at the root of disengagement, discrimination and violence. Some have already raised concerns about the feasibility of measuring students' readiness to engage with the world through an international test. International comparisons are never easy, and they are not perfect, particularly when it comes to measuring such complex competences. But without quality data, it will be difficult to initiate a fruitful, global dialogue about what works in education. What should students learn in the 21st century? Choosing anything is hard, especially when your decision might have long-term consequences for your life. A new OECD research paper looks at career decisions and career guidance. Based on 2015 PISA data, it shows that most 15-year-olds already have career plans: only around 15% of them have not decided what they want to do. But the data show that today’s teenagers aren’t very imaginative when it comes to their expected working life. Almost one in ten wants to be a medical doctor; one in three cited one of just ten jobs. Revolution. Contained within that often frightening word is another, less destabilising one: evolution. If we look at the future as the result of a series of advances propelled by megatrends, then we have a better chance of meeting the challenges it presents, rather than being ambushed by them. We will also be better equipped to prepare tomorrow’s learners. So we will start the year in January with our tri-annual report Trends Shaping Education, which scans the horizon for megatrends that will shape the demand and supply of educational opportunities, and outlines the most significant challenges facing education over the years to come.